This article originally appeared on The Grandstand on January 25. Ricky: On paper this is an intriguing semifinal: former Australian Open champions with 20 combined major titles, and also friends and countrymen. Of course, the head-to-head statistics suggest otherwise. Federer has won 18 of their 21 career meetings and he is even more dominant than that when it comes to hard courts. In fact, the former world No. 1 has never lost to Wawrinka on anything other than clay. What’s to think the tide will suddenly turn Down Under? Well, nothing. Federer is once again healthy and has been in outstanding form since sleepwalking through his first two rounds this fortnight. Wawrinka is playing decent tennis, but he hasn’t been on fire in Melbourne like he has been at times in the past. Federer is not only the better player, but he also wants it more. Federer in 4: 7-6(4), 4-6, 6-3, 7-5. Pete: Federer continues to show that his time away from the game last year allowed him to return refreshed, rejuvenated, renewed, and a threat to win majors. He owns a convincing 18-3 head-to-head mark over his countryman and the only times Wawrinka has been able to defeat Federer have all come on clay. However, Wawrinka has won three majors since the last time Federer has managed to tally one of his own. This also marks the first time that Wawrinka comes into the semifinals of a slam as the highest seed of the remaining four players. Should this match reach tiebreaker territory, Wawrinka boasts a perfect 5-0 record in ‘breakers played in this tournament, while Federer has split the two he has contested. The 35-year-old has been able to clean up his break-point conversion considerably, succeeding at a 49 percent clip (27 of 55) so far in Melbourne. The fast courts will prove to be a large advantage to Federer, who will successfully navigate his way to his first Australian Open final since 2010. Federer in 4: 6-4, 6-7(5), 6-3, 7-5. Ricky: Dimitrov’s winning percentage against Nadal is even worse than Wawrinka’s is against Federer: 1-7 lifetime, to be exact. The Bulgarian won their most recent meeting, but that was last fall when Nadal needlessly played two events in Beijing and Shanghai before shutting things down for the rest of 2016 because of a wrist injury. Like Federer, Nadal has clearly benefited from an extra-long offseason. The Spaniard has lost only once this year and he avenged that setback by beating Milos Raonic in straight sets on Wednesday. Record-wise, no one has been better than Dimitrov in 2017 (10-0 with a title in Brisbane). But he has been the beneficiary of an amazing draw Down Under–and this is where that favorable draw ends. Dimitrov doesn’t have the weapons to blow Nadal off the court and he will eventually wear down in an entertaining four-setter. Nadal in 4: 5-7, 6-4, 6-3, 6-4. Pete: At the time it happened, those remaining in the draw were very aware of the fact that Nadal managed to survive when he came back from a two sets to one deficit against Alexander Zverev in the third round. The rest of the field took special note of Nadal’s accomplishment in that match, as they knew what it could lead to going forward. Sure enough, since that win Nadal has dropped just one collective set to the No. 6 and No. 3 seeds. Dimitrov continued to stay undefeated for 2017 with a convincing thrashing of Goffin in the quarterfinals. Like Nadal, not much was being mentioned about Dimitrov’s chances to put together a deep run at the Australian Open prior to this fortnight. The Bulgarian has dropped just four of the 29 sets he has played this year in racing to 10 consecutive victories. Unfortunately for Dimitrov (and quite possibly the remaining players in the draw), Nadal’s victory over Zverev gave him the confidence boost he needed and those dividends will continue to pay off for the Spaniard. Nadal in 4: 6-2, 6-4, 4-6, 6-3. This article originally was posted on The Grandstand on January 20. Ricky Dimon of The Grandstand and Pete Ziebron of Tennis Acumen preview and pick the four best men’s singles matches on Saturday at the Australian Open. Now that Novak Djokovic is gone, Rafael Nadal hopes to avoid the upset bug when he faces Alexander Zverev. Ricky: No one (or at least not Zverev) will soon forget their only previous encounter. At last season’s Indian Wells Masters, Zverev butchered a forehand volley at match point on his own serve at 5-3, 40-30 in the third set. Nadal ended up prevailing 6-7(8), 6-0, 7-5. A best-of-five scenario would seem to be even more advantageous for an established veteran than a 19-year-old, but that may not be the case. Nadal is always a physical question mark, especially on hard courts, and Zverev bounced back nicely from a five-setter with Robin Haase by destroying Frances Tiafoe 6-2, 6-3, 6-4 in round two. The German is the prototypical Nadal nemesis: huge serve, big groundstrokes, and a two-handed backhand. Nadal has been solid through two matches, but not to the extent that I’m changing my pre-tournament pick. Zverev in 4: 6-3, 5-7, 6-3, 7-6(7). Pete: Nadal comes into this highly-anticipated match without hitting a double-fault in six sets and serving at 70 percent and 80 percent in his respective straight-set victories. As difficult as it is to fathom, the 14-time Grand Slam champion appears to be flying under the radar as a possibility to win his second Australian Open. Zverev had plenty of opportunities to defeat Nadal in their only meeting last March at Indian Wells. He will feel better about his game with his second-round straight-set win over Tiafoe after having to fight back from a two sets to one deficit in the opening round against Haase. Both Nadal and Zverev will vividly recall their encounter in the California desert for different reasons–Nadal for the mental edge that he had at the very end and Zverev for the squandered chance on match point to record a monumental win. Zverev’s failure to win the first time around against Nadal will continue to ring in his head. Nadal in 4: 6-4, 6-3, 5-7, 6-4. Ricky: Very little will separate the two competitors in this battle of one-handed backhands that should feature lots of incredible shot-making from the back of the court. Who will get the best of it? Gasquet leads the head-to-head series 5-1 and has been the more impressive through two matches. But Dimitrov won their most recent meeting last fall in Shanghai and is 7-0 this season with a title in Brisbane. The Bulgarian has been riding a wave of momentum since the second half of 2016. This could be the most entertaining match of the tournament other than Denis Istomin vs. Novak Djokovic. Well, that and–of course–Benoit Paire vs. Fabio Fognini. Dimitrov in 5: 4-6, 6-3, 6-7(4), 6-2, 7-5. Pete: A prime opportunity awaits the winner of Gasquet and Dimitrov, as whoever previals will have an easier than expected passage into the quarterfinals in facing the Denis Istomin vs. Pablo Carreno Busta winner next. Gasquet was sidelined at this time last year, denying him the opportunity to continue his excellent play in majors (semifinals at Wimbledon and quarters at the U.S. Open in 2015). We have been waiting a long time to see if Dimitrov can indeed live up to all of the hype that has accompanied his game. Thus far, one semifinal (Wimbledon 2014) and a quarterfinal (2014 Australian Open) are his best showings. Gasquet owns a 5-1 head-to-head record, but Dimitrov won most recently last October at the Shanghai Masters. Gasquet’s efficient play through two rounds as well as his confident recognition of a potential deep run make the difference. Gasquet in 4: 6-4, 5-7, 7-6(3), 6-3. Ricky: Ferrer leads the head-to-head series 2-0, but the previous meetings between the fellow Spaniards and Rio Olympics doubles partners came in 2013. Ferrer, now 34 years old, was still in his prime at that point and Bautista Agut had not yet peaked. The tables have now turned drastically, to the extent that Bautista Agut is will ahead of his countryman in the rankings (14th and 23rd)–and deservedly so. Bautista Agut is undefeated this season, with a title in Chennai and two easy wins so far in Melbourne. Ferrer, on the other hand, hasn’t shown any real signs of ending a slump that began in earnest last year. Bautista Agut in 4: 5-7, 7-5, 6-4, 6-3. Pete: Ferrer boasts a 27-6 record at the Australian Open since 2011 and corrected his game in time last round against the young American upstart Ernesto Escobedo to advance. The tennis world is certainly not used to seeing Ferrer with a double-digit seed–especially not a numeral as high as 21, where he entered the draw this year. Bautista Agut has dropped just 13 games in six sets through two matches and generally performs well in the early rounds of majors. Ferrer knows very well that time is–and has been–ticking on his solid career and this recognition, plus his years of success at the Aussie Open, will all play a part in the end result. Ferrer in 4: 3-6, 6-2, 6-4, 7-5. Ricky: Almost no one follows up a monumental, career-defining performance with a win in his next match. Sam Querrey managed to do it at Wimbledon last summer, when he stunned Djokovic and then rolled over Nicolas Mahut before falling to Milos Raonic in the quarterfinals. Still, Querrey is an aberration to the rule. And he is also far more proven with far more Grand Slam experience than Istomin. The Uzbek also endured a much greater physical test in his 7-6(8), 5-7, 2-6, 7-6(5), 6-4 upset of the world No. 2 on Thursday. 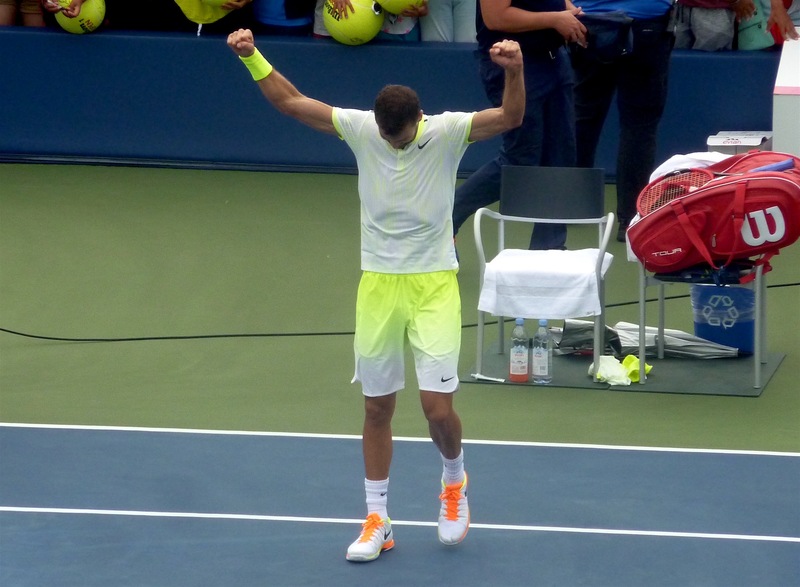 They played for four hours and 50 minutes–something Istomin did not need heading into a date with a baseline grinder like Carreno Busta who has cruised though two rounds. Istomin will be gone, but he won’t be forgotten. Carreno Busta in 4: 7-6(4), 6-2, 2-6, 6-4. Pete: Istomin stood toe to toe with the great Novak Djokovic for 288 minutes and ultimately defeated the six-Australian Open champion. Winning two tiebreakers, coming back from a two sets to one deficit, hitting just three double-faults in 29 service games…take your pick, Istomin accomplished all of that in advancing to the thrd round to match his best-ever result at this event. Next up is Carreno Busta, who lived up to his No. 30 seeding by winning his first career matches in Melbourne in this, his fourth appearance. The Spaniard swept aside upstart Brit Kyle Edmund with surprising ease and has spent 39 minutes less time on court in his two matches than Istomin had to play in Rod Laver Arena against Djokovic. The veteran Uzbek recognizes that he has quite an opportunity to keep his feel-good story going for a bit longer and will prevail. Istomin in 4: 3-6, 6-2, 7-5, 6-4. This article originally appeared on The Grandstand on January 17, 2017. Ricky Dimon of The Grandstand and Pete Ziebron of Tennis Acumen preview and pick the four best men’s singles matches on Wednesday at the Australian Open. Nick Kyrgios is taking the court and so are a throng of Americans, including John Isner and Jack Sock. Ricky: These two guys squared off in the fourth round of the 2015 Australian Open and it was a showdown that won’t soon be forgotten. Just 19 years old at the time, Kyrgios battled back from two sets down to score an epic 5-7, 4-6, 6-3, 7-6(5), 8-6 victory. Unless the Aussie’s knee issue flares up, there is no reason to think this one will be so complicated. He thoroughly beat down Gastao Elias 6-1, 6-2, 6-2 on Monday and Seppi, despite a decent four-set win over Paul-Henri Mathieu, is clearly past his prime. Kyrgios in 3: 6-3, 6-4, 6-4. Pete: Kyrgios may or may not be aware of the fact that Seppi defeated Roger Federer at the Australian Open two years ago. Either way, it really won’t matter–as Kyrgios will take the court and play his game no matter whom he faces on the other side of the net. This game-plan (or lack thereof) by the young Aussie works against much of the ATP field. Seppi, who was seeded last year in Melbourne, now may tumble outside of the top 100 if he fails to win this match. The game of the Italian is respected in the locker room, but Kyrgios has no fear of anyone on tour–except Andy Murray. Kyrgios will once again be in full flight and on to the third round. Kyrgios in 4: 6-2, 7-5, 4-6, 6-3. Ricky: Harrison was the victim of bad draw after bad draw at slams in the early stages of his career. But a bad draw this is not. The 24-year-old American clobbered Nicolas Mahut in his opener and now faces an opponent who is dangerously close to plummeting out of the top 10. Harrison lost their only previous encounter, but it was via an encouraging 6-4, 6-7(2), 6-4 scoreline last summer in Toronto. Expect something similar on Wednesday, with the underdog putting up a real fight before Berdych’s experience proves to be the difference. Berdych in 5: 6-7(5), 6-3, 4-6, 7-6(3), 6-2. Pete: The top quarter of the men’s draw is absolutely loaded, with the winner of this match having to most likely face Federer in the third round. Berdych takes care of business in the early rounds of majors, having reached the fourth round or better in his last eight such appearances. Harrison will bother him for a while out of the gate, as he will be attempting to reach the third round of a slam for the second consecutive time and match his career-best slam result. The American has an opportunity to see how his game matches up against a solid foe, and he will have to settle for that as his only take away from the contest. Overall, the complete game of the Czech will make inroads and he should mostly cruise. Berdych in 3: 6-4, 7-5, 6-4. Ricky: Sock is off to an outstanding start in 2017. He went 3-1 in singles at the Hopman Cup and then captured his second career ATP title in Auckland. The 24-year-old American had underwhelmed at slams until last summer’s U.S. Open, where he upset Marin Cilic before losing to Jo-Wilfried Tsonga in in a four-set fourth-rounder. Interestingly, Sock’s path to the Aussie Open quarterfinals is the same–but in reverse order: Tsonga in round three and Cilic in round four. Of course, he first has to get past Khachanov. The 20-year-old Russian is an up-and-coming talent who lifted an ATP trophy last fall in Chengdu. Huge baseline hitting is sure to be on display from both men in this one, but it’s Sock who has been here before. Sock in 4: 6-2, 6-7(6), 6-3, 6-3. Pete: Sock won his second career title last weekend in Auckland. He appears ready to take the mantle from Isner as the top American this year and maintain that distinction going forward. Yet, one wonders how good he can be if he decides to dedicate himself to a serious fitness program. Khachanov appeared briefly on the radar of tennis aficionados as a 17-year-old in 2013, when he defeated Janko Tipsarevic to reach the quarterfinals of the 250-point event in Moscow. He shot up the rankings with the Chengdu title last October and now finds himself in the second round of a major in as many appearances, this time against a talented American. Sock has been around the block considerably more than his Russian opponent and this fact makes the difference in the match. Sock in 4: 6-7(5), 6-2, 7-5, 6-3. Ricky: This matchup is nowhere near as good for Isner as his 2-0 head-to-head series lead suggests. Their first meeting can be discounted because it came back in 2009. They just recently faced each other last fall in Paris, where Isner prevailed 7-6(8), 6-4 on his way to the final. But Zverev had played a ton of tennis heading into that event and must have been fatigued. It was also on a relatively fast indoor hard court. This time around Isner will have to deal with oppressive heat, which he has never liked. The 6’10”’ American has also never liked playing lefties, his two wins over Zverev notwithstanding. This has major upset potential for the in-form German. Zverev in 4: 7-6(6), 6-7(7), 6-4, 7-6(4). Pete: Isner fired 33 aces in his opening-round match en route to a four-set victory over Kravchuk. He can expect a comparable performance in the next round against the veteran Zverev, as well. It is a bit surprising that the lanky American has reached just one quarterfinal appearance in a major in his career. However, Isner finished 2016 strong in reaching the Paris Masters ginal (lost to Murray, whom he may meet again in the Aussie Open round of 16). Zverev will consider his berth in the second round a success, as he recorded just his second win ever at the Australian Open with a straight-set defeat of Garcia-Lopez. The lefty will perform well for a set and a half before the 19th-seeded American begins to take over. Isner in 3: 7-6(4), 6-4, 6-3.